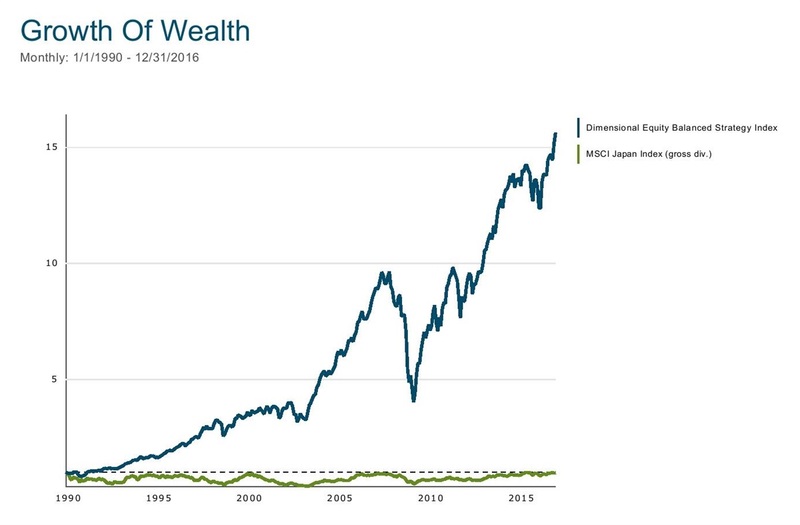 Only one word that should convince you about the need to diversify your investment portfolio globally: Japan. Since 1990, we've lived through a 27-year stretch where Japanese large cap stocks (the equivalent of the S&P 500) have had a negative total return. Japanese investors who put all their money in their own home market haven't even gotten back what they started with a quarter century later. Over this period, every other region of the world has performed remarkably well. A globally diversified index portfolio compounded at +10.7% per year over this period (including its stake in Japan), and $1 grew to almost $16. Of course, the odds that this happens to the US stock market are small. But why make the gamble?